Some days, driving to the bank or searching for the right ATM, seems like too much effort to deposit a single check. Over the past few years time-crunched consumers have found some relief in the form of banks offering the ability to remotely deposit checks with a smartphone. While the technology may be convenient, a new report found certain drawback to the program, including poorly disclosed terms and conditions. The Pew Charitable Trusts report [PDF] on mobile remote deposit capture (mRDC) examined how financial institutions present the key feature of mobile banking to their prospective customers and found that many lacked vital information. mRDC, which was first introduced in 2009, allows individuals to take smartphone or tablet photos of endorsed paper checks and deposit them through an app from their bank or prepaid card company. Since its inception the program has steadily grown in usage and popularity, according to the Federal Reserve. Pew examined mRDC availability and policies at 50 banks and 51 prepaid card companies, identifying 10 key terms and conditions, including cost, time before deposited funds become available, and eligibility requirements, that prospective customers are likely to consider when deciding if the technology is for them. The report found that banks are more likely than prepaid card companies to offer mRDC, although several large banks still do not offer the technology. In all, 37 large banks offer mRDC, while 13 did not. Additionally, seven prepaid card companies offer the technology, while 14 offer it through third-party vendors and 30 do not offer the product. Of the banks that offered mRDC services to consumers, 13 disclose terms online and in an app, while 22 provide disclosures online only. Among prepaid card companies, only two offered terms online and in apps, and 19 offered the disclosures online only. Only one of the large banks that offer mRDC provided details on all 10 of the terms Pew identified. And although the bank’s terms were transparent, Pew determined they were not idea. “Per its disclosure, the bank does not notify account holders of the mRDC deposit’s status—whether it is approved or rejected, or whether a hold is placed on the deposited funds,” the report concluded. Additionally one of the 37 banks offering the service didn’t supply any of the 10 pieces of information sought by Pew. The two prepaid companies with both types of disclosures were found to have errors in their content. For example, the app for one of these banks lists the cutoff time for processing a deposit as 6 p.m. and as 9 p.m. on its website. The second bank shows the check-retention requirement for consumers once funds have been deposited as two days on its app and as 14 days on its website. No inconsistencies appear in the mRDC disclosures provided by GPR prepaid card companies. As for the cost of mRDC, 28 of the 37 large banks disclose that they offer the service free of charge to consumers. 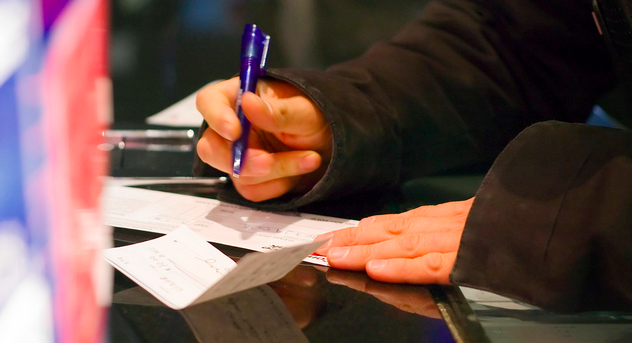 Three other banks charge $0.50 per check deposit, while two waive the fee under certain conditions. Customers using prepaid companies’ mRDC will likely incur more costs for the service. Only two companies disclose their fee as free, while two have a cost of $4 per deposit, and 16 charge as much as 4% of the deposit in exchange for making funds available immediately. However, all but one of the companies offer free options that require longer waiting periods. While it might be tempting to go on a mDRC deposit spree, Pew found that most banks limit the amount a consumer can deposit in one month with varying price points. The minimum limit disclosed by banks was $2,500 per month, and the maximum was $750,000 per month. 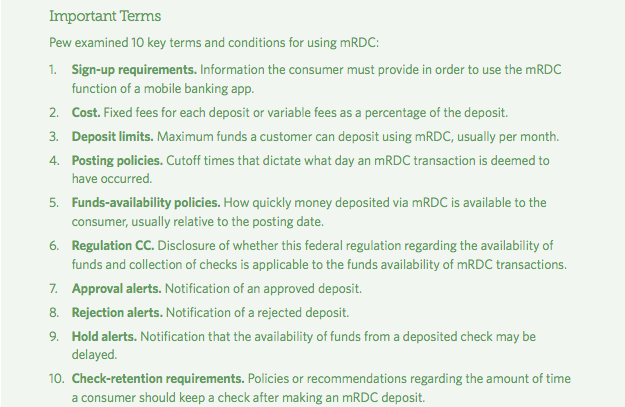 However, 13 of these banks either do not disclose the existence of mRDC deposit limits or do disclose that they have these limits but do not provide details about them. Limited deposits for prepaid card companies were significantly less, ranging from $1,500 to $10,000 per month. Additionally, the companies were more likely to disclose the limits, with 20 offering disclosures, while only one did not. Perhaps one of the most important disclosures that consumers would look for in a mRDC service is the amount of time they must way before deposited funds become available for use. Banks are required, under federal rules, to disclose funds-availability policies to consumers. However, Pew found that banks’ mRDC offerings cannot always obtain that information because of lack of clear disclosure. Of the banks that offer mRDC, a whopping 18 do not provide disclosures on when funds would be available. One bank makes funds available immediately, one offers a variety of options, 13 disclose availability between one and two days after posting and four disclose availability of three and five days after posting. Again the disclosures for prepaid card companies appeared to be more readily available than those of larger banks. None of the companies lacked a disclosure on fund availability. Four state that funds from approved deposits will be fully available within minutes. Another 15 offer almost immediate access to funds in exchange for a fee but also offer no-charge deposits for those willing to wait longer. Two card companies do not offer an option for immediate funds availability; customers’ deposited money is accessible in two and six days after posting. Although Pew did not provide policy recommendations for banks and prepaid card companies offering mRDC services, researchers make it clear that better disclosures are needed. Providing clearer disclosures would go a long way in producing better informed consumers.